To start with an apparent non-sequitur, consider Rav Sha'ul's words when he appears before the Sanhedrin in Jerusalem. He had been arrested by the Romans, after a riot has nearly blown up because he has been accused of bringing Gentiles into the Temple. The next day, the Roman tribune summoned the Sanhedrin so that he might find out what all the fuss was about. Luke tells us that, "When Sha'ul perceived that one part were Sadducees and the other Pharisees, he cried out in the council, 'Brothers, I am a Pharisee, a son of Pharisees. It is with respect to the hope and the resurrection of the dead that I am on trial'" (Acts 23:6, ESV). Immediately the Sadducees and the Pharisees start arguing between themselves and the tribune had to whisk Sha'ul away as things were starting to get violent. HaShem "keeps His faith with those who sleep in the dust" and bless Him as the one "who raises the dead". Given that the word 'resurrection' makes not so much as one appearance in the Hebrew Bible, why do our Jewish people have such a strong and enduring faith in an end-times resurrection of the dead? On what basis, on what texts did Rav Sha'ul - trained as he was by Rabban Gamaliel in Jerusalem - base his claim; not for individuals coming back to life in this world, for the Prophets contain a number of examples of this, Yeshua raised several people and was Himself raised after "three days and nights in the earth" (Matthew 12:40), but of a general or mass resurrection at the end of days? Josephus tells about the beliefs of the two largest Judaisms in Yeshua's time: "The Pharisees, who are considered the most accurate interpreters of the laws ... maintain that every soul is imperishable, but the soul of the good alone passes into another body, while the souls of the wicked suffer eternal punishment (Jewish War 2.163); they believe that souls have power to survive death and that there are rewards and punishments under the earth for those who have led lives of virtue or vice (Antiquities 18.14); The Sadducees hold that the soul perishes along with the body (Antiquities 18.16); as for the persistence of the soul after death, penalties in the underworld, and rewards, they will have none of them (Jewish Wars 2.164)." Like the Pharisees, the Essenes too held to a belief in an eternal soul. We might not be comfortable with all the mechanical detail Josephus gives, but the overall concept of resurrection is present. But still we have no texts or verses upon which to build; where did the resurrection come from? Rashi tries to explains the language: "'it is not written 'to give to you', but rather 'to give to them'. From this we learn that the Resurrection of the dead is from the Torah." Let's try that again, more slowly: Moshe is speaking to the people of Israel as a whole, in the second person plural, which we can see from the ending on the word " , to your fathers". It was the fathers - Avraham, Yitz'khak and Ya'akov - who were given the promise of the Land to which HaShem committed Himself by swearing an oath. But what was the promise of the Land? " to give to them", not " to give to you". And since the fathers have all died - been gathered to their people - and laid to rest in the Macphelah Cave, if they are to receive the promise, they must be resurrected. Exactly the same logic (and language construction) is also used with HaShem's words forty years earlier to Moshe in the verse "I also established My covenant with them, to give them the land of Canaan, the land in which they lived as sojourners" (Shemot 6:4, JPS). You have to be alive to inherit or receive a gift! The Talmud records Rabban Gamaliel being quizzed by sectarians, "How do we know that the Holy One, blessed be He, will resurrect the dead?" 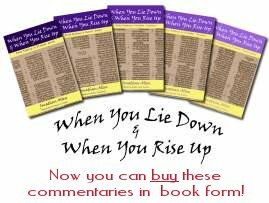 He answered them "from the Torah, the Prophets, and the Writings" and cited the following verses: "From the Torah: for it is written, 'And the L-rd said to Moses, Behold, you shall sleep with your fathers and rise up' (D'varim 31:16)1 ... from the Prophets: as it is written, 'Your dead men shall live, together with my dead body shall they arise. Awake and sing, you that dwell in the dust: for your dew is as the dew of herbs, and the earth shall cast out its dead' (Isaiah 26:19) ... from the Writings: as it is written, 'And the roof of your mouth, like the best wine of my beloved, that goes down sweetly, causing the lips of those that are asleep to speak' (Song 7:9)" (b. Sanhedrin 90b). A text from each section of the Tanakh! Oddly, Rabban Gamaliel makes no reference to the arguably clearer text at the end of the book of Daniel: "At that time, your people will be rescued, all who are found inscribed in the book. Many of those that sleep in the dust of the earth will awake, some to eternal life, others to reproaches, to everlasting abhorrence" (Daniel 12:1-2, JPS). This might be because it only refers to 'many' and not all, or because it is spoken by angel rather than Moshe, HaShem or a prophet. It seems clear, then, that some of the Second Temple Judaisms had developed a substantive doctrine of the resurrection of the dead, which both a historian and the later rabbis report in various levels of detail and from their respective points of view. This doctrine was sufficient to promote extremely robust debate between those of differing persuasions. More, it was widely enough known not only among the Jewish people themselves, but also to the Roman authorities who governed them, that Rav Sha'ul could speak about it in a number of contexts and be understood without lots of background explanation. It differed sharply from Greek ideas about eternity who, although they believed souls or spirits were eternal, found the idea of bodily resurrection repugnant, looking for the soul to be released from the physical body and move on to purer and better things. The Jewish resurrection is distinctly physical. Let's move on now to the promises in which we stand as believers in Messiah Yeshua. Rav Sha'ul sets out his argument carefully, starting with, "For I delivered to you as of first importance what I also received: that Messiah died for our sins in accordance with the Scriptures, that He was buried, that He was raised on the third day in accordance with the Scriptures, and that He appeared to Cephas, then to the twelve" (1 Corinthians 15:3-5, ESV). Strange as the idea of resurrection may seem to modern minds, the Hebrew Bible reports at least three instances of this, in the days of the prophets Elijah and Elisha. Besides Yeshua, the gospels report another three (Lazarus, Jairus' daughter, the widow of Nain's son) and Peter raised Tabitha in Acts. This is the context in which Sha'ul speaks of Yeshua's resurrection: "This happened, these are the facts," he says, but there is a huge difference between Yeshua and everyone else. All the others who had been restored to life died again, as is the way of mankind, because although life returned, it returned to their existing physical bodies in this world. Yeshua, on the other hand, was raised with a new, spiritual or heavenly body, which allowed Him at the same time to appear to the disciples in Jerusalem behind locked doors, yet to eat fish and bread with the disciples. Yeshua did not and has not died again. He is alive for ever. But there is still no promise for us. When will that come? Rav Sha'ul continues, "in fact Messiah has been raised from the dead, the firstfruits of those who have fallen asleep" (15:20, ESV). Yeshua is the prototype, or perhaps more accurately, the first production model, of all those who have died. because "in Messiah shall all be made alive. But each in his own order: Messiah the firstfruits, then at His coming those who belong to Messiah" (vv. 22-23, ESV). Just as the firstfruits is the first part of the crop to ripen, with the rest to follow, so Messiah has risen from the dead, with a new heavenly body, and all those who are "in Him" will also rise when He returns. Even Sha'ul is amazed: "Behold! I tell you a mystery. We shall not all sleep, but we shall all be changed, in a moment, in the twinkling of an eye, at the last trumpet. For the trumpet will sound, and the dead will be raised imperishable, and we shall be changed" (vv. 51-52, ESV). That is our promise and the oath we have from G-d: that we and those who went before us - all who heard and believed G-d's promise and oath - will inherit the land that He promised to our fathers. 1. - This requires a little creative re-alignment of the phrase boundaries indicated by the Masoretic trope marks. The 'normal' translation reads, "You shall lie down with your fathers; and the people shall rise up and go astray ...", but Rabban Gamaliel, who predates the Masoretic markings by some six-to-seven hundred years, rephrases it as, "You shall lie down with your fathers and rise up; and the people shall go astray ...". In this he is supported by Rabbi Joshua ben Hananiah and Rabbi Simeon bar Yohai. Application: Uncertainty in the matter of inheritance can be spiritually stressful! We need to be certain that we will inherit what G-d has promised us and the fathers of the faith - check it out today and make sure that you know that you know. Your turn - what do you think of the ideas in this drash ? Email Your email address is kept private. Our editor needs it in case we have a question about your comments. Like most print and online magazines, we reserve the right to edit or publish only those comments we feel are edifying in tone and content.